In 1977 the first Ocean Alexander yachts launched into the seas and set a tone for all remaining Ocean Alexander yachts yet to be. What started as a unique endeavor in the wide world of yacht-building, has become a brand characterized with strength, safety, and timeless beauty. The Ocean Alexander 112 Tri-Level Motoryacht is a culmination of decades of yacht-building experience with world-renowned marine talents in the top of their fields. The 112’ is designed by Evan K. Marshall, naval architect based in London, widely recognized for his custom designs of several megayachts. While the engineering was completed by Gregory C. Marshall, award-winning naval architect based Victoria, Canada. While some builders choose to keep design and engineering in-house, Ocean Alexander feels that by working with talented firms across the globe, it allows them to provide a final product that is the best combination of effective innovations in the industry. When you take a step on board the Ocean Alexander 112, you’ll see the difference for yourself. We’ve taken our alliance with Evan K. Marshall to a different level. The new 112 lets light pour in, opens interiors in entirely new ways, and beautifully reflects how owners and their guests really use a boat: for privacy, luxury and intimate entertaining. 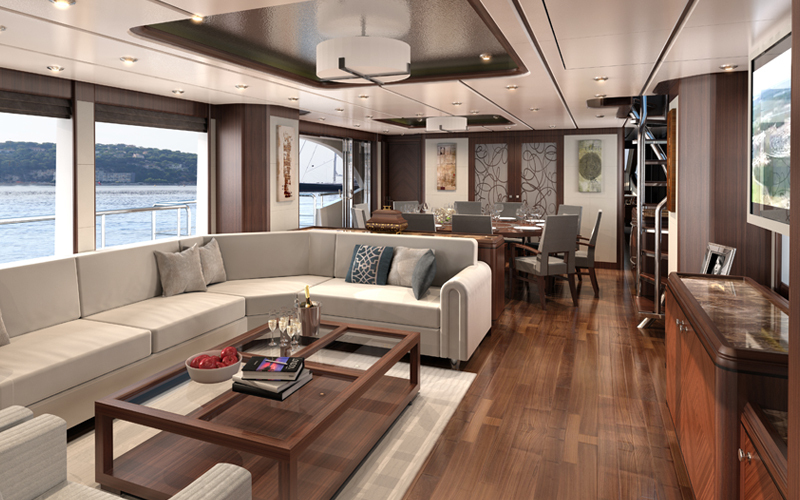 Twenty-four feet of beam translates into an immense view and generous floor space throughout the main deck. You enter to find high ceilings and a gleaming black walnut sole setting off a full complement of custom-made furnishings. Your view is maximized with audio-visual components that fold down from ceilings and electric blinds that glide out of your way. Forward is a dining table with seating for 10 and huge floor-to-ceiling windows that allow sky and sea to set the tone. 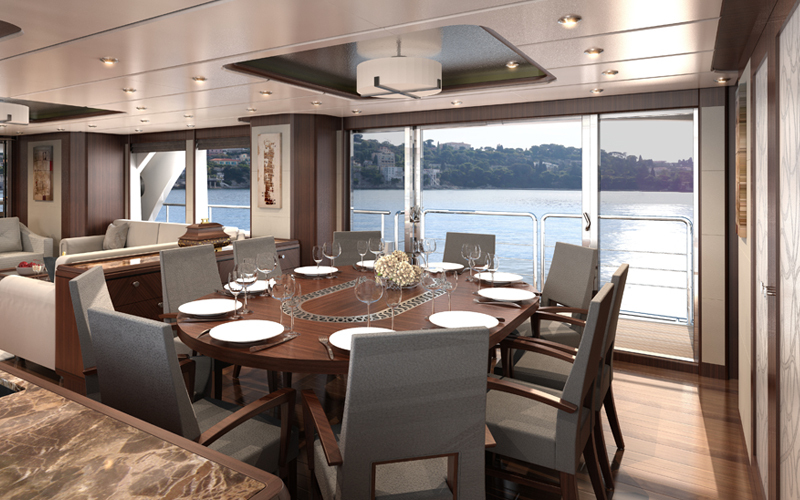 The 112 accommodates 10 guests and six crew. With two locations for al fresco dining and a formal dining on the main level, there are multiple options for the owners, or charter guests, to enjoy meals onboard. A happy chef might be one of the most important details while at sea. We not only believe it; it shows the second you enter the gleaming galley. The galley has been designed with efficiency in mind. Counters and storage are located to create a smooth flow while working in the galley. World-renowned appliances such as Wolf ® and Sub-Zero®, the same brands you enjoy at home, are also used on board. Granite countertops and immense storage makes this a dream space for any foodie or professional chef. Forward on the main deck is where one will find the master stateroom. You claim the forward deck with your own private entrance to a wide-open stateroom. A raised sofa and table are the perfect spot for morning coffee or a nightcap. A custom-fitted vanity and large walk-in hanging lockers are a testament to Ocean Alexander’s extraordinary cabinetry craftsmanship. Four steps down from the king berth is an enormous private bath suite with both a spa tub and marble-clad shower. Spacious his-and-her vanities, backlit mirrors and costly fixtures make this private spot a true luxury. 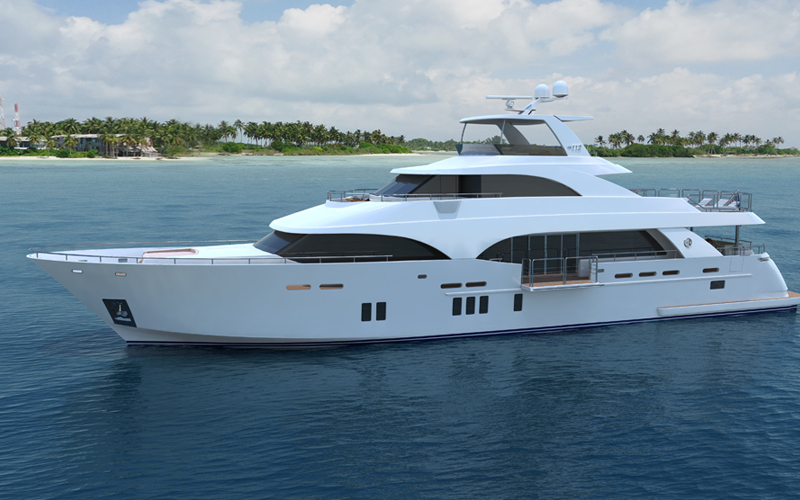 The 112 proves its devotion to your guests with four private guest staterooms below decks. These beautifully appointed accommodations impress with their quiet, custom finishing touches and generous storage space. Each stateroom is fitted with hallmark Ocean Alexander exotic-wood cabinetry and opulent stone or marble in their matching private heads. 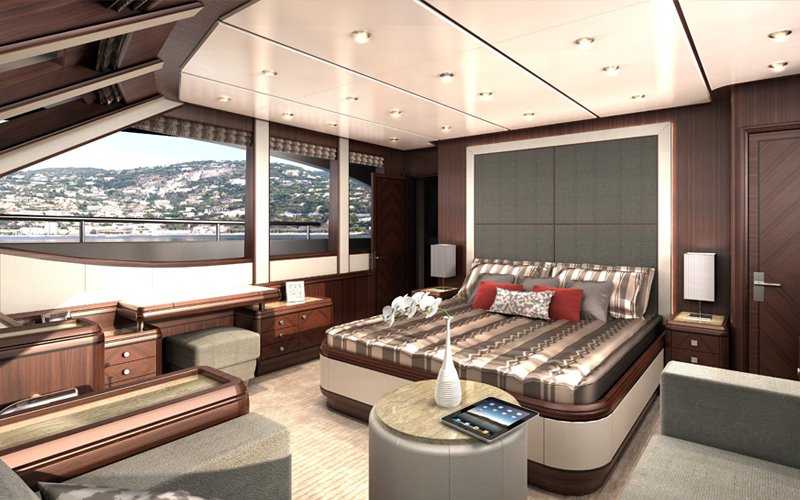 Fabrics and finishes rival the master suite for world-class luxury. The 112 not only provides incredible sanctuaries for you and your guests to relax in, the exterior entertainment spaces are what makes the 112 the envy at the dock. 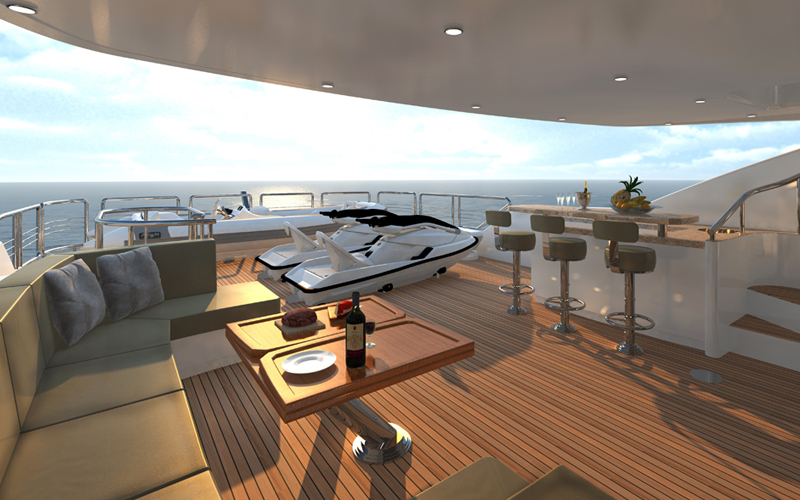 The Aft Bridge Deck not only has plenty of room for tender and toys, this spot is devoted to relaxation. To port is a fully equipped wet bar and barbecue. To starboard is a huge curved settee for lounging. Paired with a fold-out table, it’s also a perfect place for aperitifs. With a view this inspiring, no sunset should ever go to waste. Forward of the Bridge Deck, is another perfect spot for enjoying sea, sun and good company. This comfortable wraparound settee surrounds a table perfect for a sunset dinner for four. Sunpads are also built-in forward to provide a comfortable place to enjoy being anchored out at sea while looking out over the bow. At the top of the 112 is an airy, partially shaded sun deck. By day or under the stars, this is the vantage point from which the skies and sea unfold around you. Enjoy it soaking in the spa, sitting at the bar, watching television or lounging at the huge settee. While all of the above sounds incredibly relaxing and entertaining, underneath it all, the 112 is designed and built to take you and your guests out to sea safely. 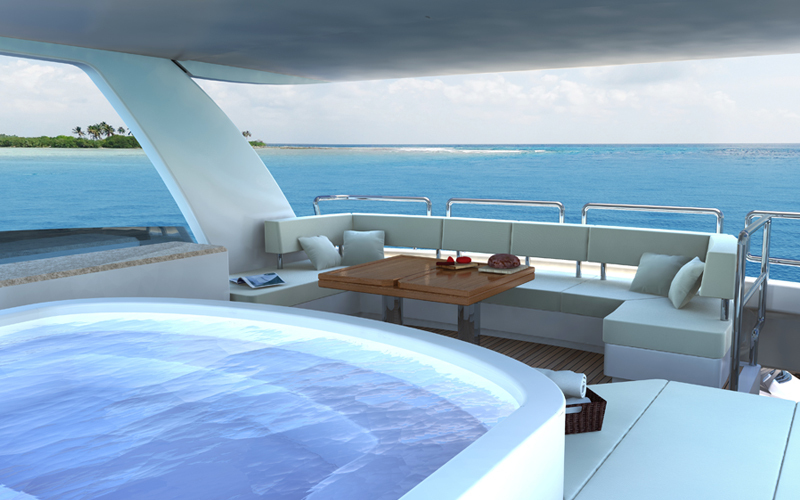 The 112’s main bridge gives your captain a high 180-degree view of seas and conditions. Set apart from the owners and guests, the pilothouse features two watertight access doors for crew. A desk/work station for your captain is aft of the main helm. From the bridge, it’s clear the 112 is built for smooth sea handling. Aft of the command center is a highly functional captain’s office tucked into our gleaming custom cabinetry. A nearby raised settee and table can be a place for guests to enjoy being part of the journey.